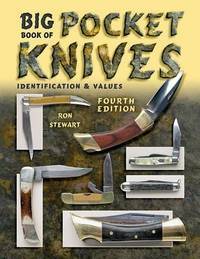 The fourth edition of Big Books of Pocket Knives continues a tradition of excellence. It enables collectors to examine knife and cutlery products as they were originally advertised and promoted. Both the serious and curious can look directly at the way manufacturers described and promoted their products. Target markets can often be found in the descriptions of the 2,000 illustrated knives and knife products. Companies and brands include collectibles such as Case, Remington, Russell, Cattaraugus, Winchester, Robeson, as well as less studied brands such as Aerial, Holley, Golden Rule, Mahrer & Grosh, Marbles, Miller Brothers, Pal, Napanoch, Shapleigh, Schrade, Camillus, and Western. There are more than 50 brands in this edition with each illustrated knife having a 2010 collector value listed. This book is a must have for collectors who are interested in studying antique cutlery collectibles as they were described to merchants and customers.